The history of both vinyl and aluminum is quiet similar. The former came into existence in 1950 and the latter in 1947. The use of aluminum siding came into existence when after World War II, Jerome Kaufrna who was the largest home improvement material dealer used baked aluminum for siding purpose. Presently vinyl is largely used but the era seems to be marked by the return of aluminum siding. For short duration and normal weather conditions vinyl siding is advised, but for long duration and heavy atmospheric condition aluminum siding is preferred. Vinyl is also cost effective whereas aluminum cost on the bitter side. Vinyl siding or aluminum siding? Vinyl siding material is both durable as well as requires low maintenance. It came into use in 1950 but by that time vinyl came in a category of weak material and was difficult to convert. With the growing technology the quality of vinyl has improved drastically. Now it can be obtained in many shape and structure. Disadvantage of vinyl is that vinyl when aged becomes brittle. It develops cracks and in the long run it has to be checked in a span of 6 to 7 years. Even in case of house fire, vinyl releases poisonous fume which is more harmful than carbon dioxide and carbon monoxide as well. It even melts when exposed to extreme hear in case of a barbeque. Aluminum is being used from 1930’s. 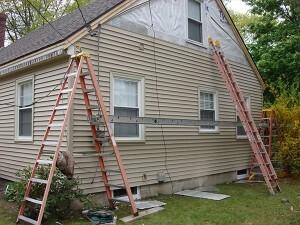 But it was hardly hit by other siding materials such as vinyl siding, wood siding etc. Aluminum being a strong material it is used as siding in high pressure areas and those areas which are regularly hit by storms and forest fires. Aluminum is heat-resistive as compared to vinyl. In case of hail storms aluminum is prone to dents. Another major disadvantage of aluminum siding is that if it is placed in extreme heat conditions, it loses its color which then would be difficult to find the same set of siding color. Even if aluminum siding is scratched the paint is out. So both can be used keeping in mind the environment conditions and adding a mark to interior and exterior of the house. As mentioned above, both have distinctive property. Both vary in cost. They even vary in thickness, vinyl siding have thickness between 0.046 inch to 0.070 inch whereas aluminum siding have thickness of at least 0.020 inch. They vary in color such as vinyl comes in different solid color but aluminum is baked with enamel. There is a big difference between the costs of the two. Vinyl siding cost starts from 1$ to 5$ which is much cheaper than the cost of aluminum siding which costs 3$ to 8$ per foot. Vinyl siding stands for at least 10 years but the average life span of aluminum siding is 35 years. In case of color and shape combinations, vinyl can be preferred over aluminum but in the matter of long run and less exterior look is required aluminum is to be used over vinyl. This all will help you choose the Vinyl or Aluminum siding better. So both have different features, one has long life but other has color as well as shape options. So a professional contractor should be consulted before opting for any siding material for the first time. As we have discussed the difference between vinyl siding and aluminum siding. The advantages and disadvantages of both are explained and also a comparison is done between the cost, nature and availability of the sidings. So in the present day comparison vinyl siding is hit by aluminum siding. It is supposed to be a comeback to aluminum. « Vinyl siding thickness, does it matter?